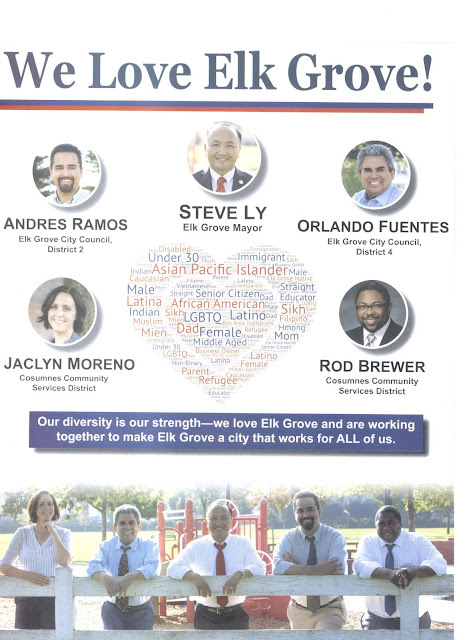 In what is likely to be the first of several mailers for the hotly contested Elk Grove mayoral race, candidate Steve Ly made first contact with a mailer that appeared in mailboxes today. The mailer from Ly is titled "Vote for Elk Grove's Democratic Team," and features not only Ly but his informal running mates for the Elk Grove City Council. Ly, who is seeking his second term as mayor has no current allies among the four other city council members currently seated and has aligned with Andres Ramos and Orlando who are challenging Pat Hume and Stephanie Nguyen respectively. 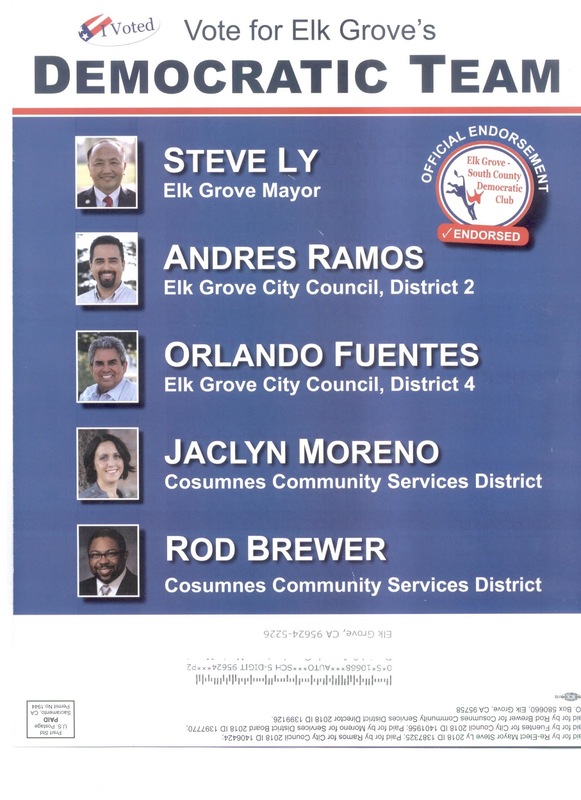 Additionally, the mailer features Cosumnes Community Service candidates Director Rod Brewer, who is seeking reelection, and Jacklyn Moreno. There are two other candidates, Koi Rivers, and Jerry Braxmeyer, who are seeking the two open at-large seats on the board. 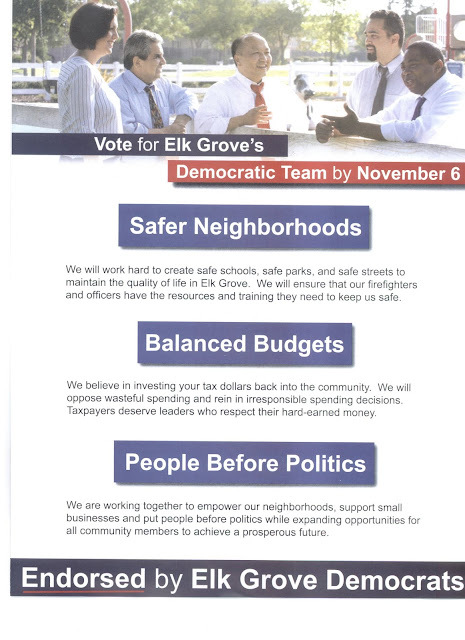 The mailer, which has already been distributed with the reusable grocery bags and plants the Ly campaign has distributed, features bullet point issues typically found in local election including safer neighborhoods, fiscal responsibility and a people first appeal. The mailer does make a broader, albeit unspoken appeal perhaps to Democratic voters frustrated with the Trump administration. 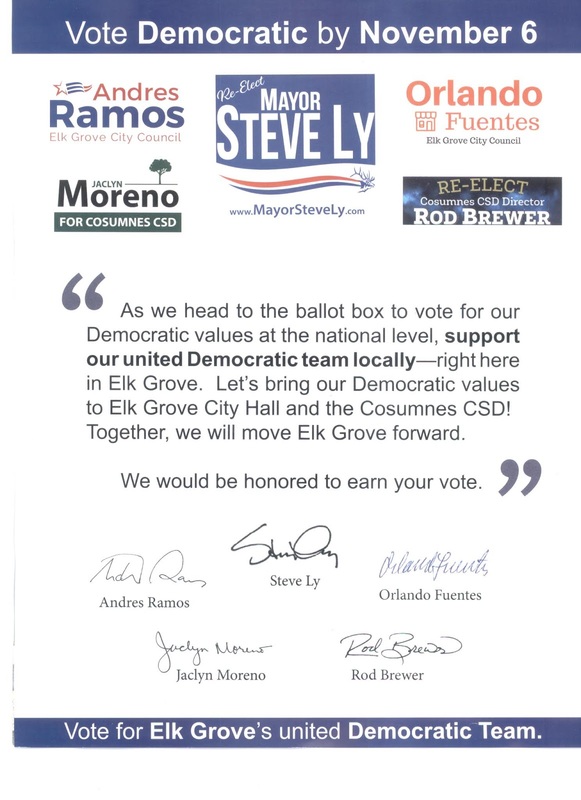 The mailer tells voters "As we head to the ballot box to vote for our Democratic [our emphasis, as in party] values at the national level, support our united Democratic team locally - right here in Elk Grove." Nationally, Democratic voters are thought to be highly motivated to vote during this midterm election. Historically, Democratic voters have lower participation rates during non-presidential elections than Republicans. Although the mailer notes that it was paid by committees for all four candidates, by far, Ly has the most campaign money at his disposal. Ly has committed to offering help to the other four candidates, and with this being his first mailer, he appears to be making good on the promise. Ly is vying for his second term against Tracie Stafford and Darren Suen, who is currently serving as Elk Grove's vice mayor. 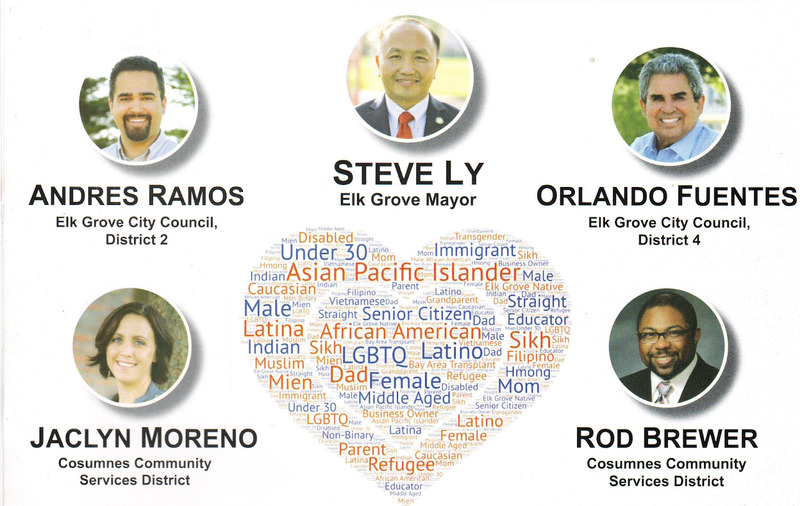 While Stafford is conducting her campaign as a stand-alone candidate, Suen has emphasized his support from fellow city council candidates and council members Hume and Nguyen, but the three have not indicated they have any plans to share mailers or coordinate get-out-the-vote efforts although Nguyen and Suen are sharing campaign office facilities.